Spindles are used in high speed, automated (usually CNC) machining applications. 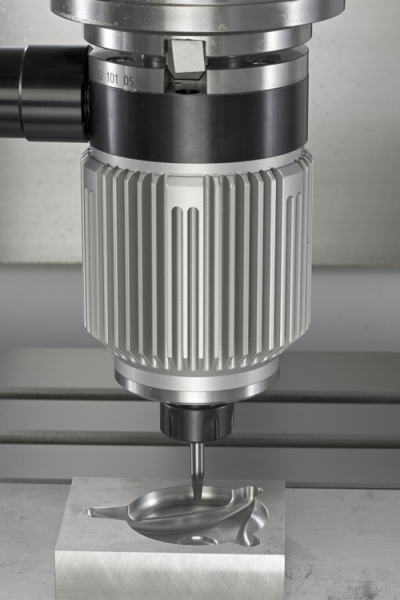 The spindle itself rotates at high RPMs with a machining tool or implement attached, and can be used to perform drilling, milling, engraving, cutting, and lathe operations. Higher spindle rotation speeds generally equate to greater precision, accuracy, and surface finish. Plug-N-Go spindles are specially designed to be compatible with nearly any CNC machining center. They combine high speed milling spindles with specialized mounting tapers that fit into standard CNC machine tool spindles. This gives the CNC system high speed machining capabilities without permanent modifications. To maintain their performance at continuous high speeds, Plug-N-Go spindles are generally either air cooled or liquid cooled. IBAG North America offers four Plug-N-Go spindle models that are specially engineered for high accuracy and low vibration, with maximum speeds of 60,000 RPM and power up to 10 kW.